One of the most distinctive features of Mark’s writing style is that he seems addicted to the word immediately. The word shows up 42 times in his gospel, 12 times in the first chapter alone. (After that, Mark settles down a little.) 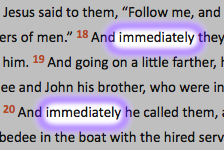 In most versions of the English Bible, not every occurrence of the word is translated from the original language. Trust me, though—it’s used a lot. This has led many people to declare that Mark’s gospel is a gospel of action and that he uses immediately to communicate “a sense of speed and urgency” (ESV Study Bible footnote, Mark 1:10–11). Odds are, though, that immediately is, like, just a filler word for Mark, like, you know, like is for us. And that Mark’s got a writing style similar to this imaginary author.